Decoupling looks like an obvious idea, isn't it? After all, isn't that true that we are becoming more efficient? Think of a modern LED light compared with an old lamp powered by a whale oil. We are now hundreds of times more efficient than we were and we also saved the whales (but, wait, did we.....?). So, if we can do the same things with much less energy, then we could grow the economy without using more energy, solving the climate problem and also the depletion problem. It is part of the concept of "dematerialization" of the economy. Then we paint everything in green and all will be well in the best of worlds. 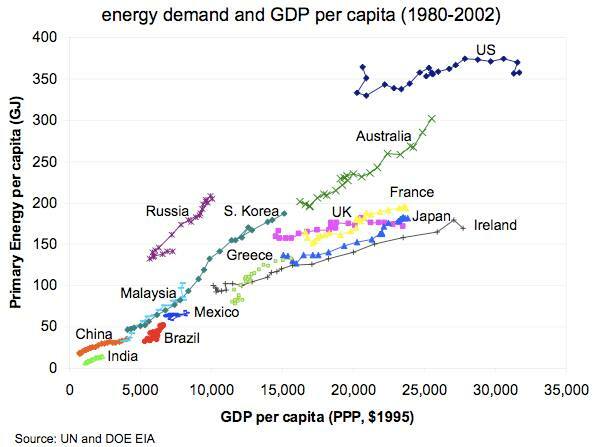 Note how closely related the GDP an the world's energy consumption are. It is impressive because the GDP is measured in terms of money flows. So it seems that money, although not a measure of power in itself, is a proxy for power. The idea that "money is power" doesn't seem to be just a metaphor. Now, by carefully looking at the curve, we could say that we have been doing a little better in recent years. That is, we seem to have been able to produce a little more GDP for the same amount of energy. But there are two problems: the first that the divergence we see today is not larger than anything we have seen during the past 50 years. 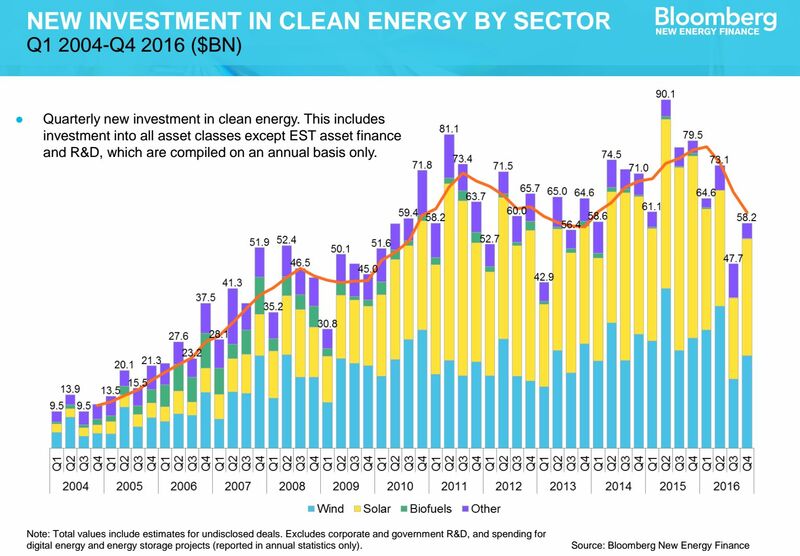 The second that this is NOT decoupling as it is normally defined, that is, the ability to grow the economy (the GDP) while at the same time consuming less energy. 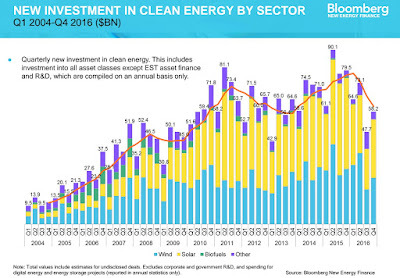 Of course, we may argue about the definition of decoupling, but nothing short of a complete inversion of the current trend would allow us to keep growing while, at the same time, avoiding the double challenge of climate change and of mineral depletion. But if that were happening, you would see the little circles in the graph completely change the slope of the curve, forming a kind of "hockey stick" shaped curve. That's not the case, obviously. Actually, if you really eyeball the curve, you can see a small hockey stick that occurs at points 14-16. 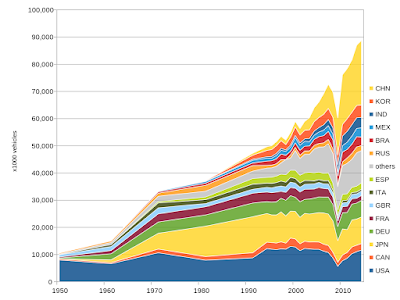 These points correspond to 1979-1981, a historical phase of reduced energy production during the most difficult moment of the great "oil crisis." For about three years, at that time, we had true decoupling, but it was hardly something pleasant or that we would want to repeat today in the same terms. In the end, society needs energy to function and the idea that we can do more with less with the help of better technologies seems to be just an illusion. If we reduce energy consumption, we'll most likely enter a phase of economic decline. Which might not be a bad thing if we were able to manage it well. Maybe. Calling this "a challenge" seems to be a true euphemism, if ever there was one. But, who knows? Happy 2018, everybody! I haven't been able to find the origin of this graph, but it seems to be legitimate (note how the axes are exchanged with respect to the one I showed before). The curves for single states are noisier than those for the global economy, which may indicate that states move high energy intensive activities from one to another. 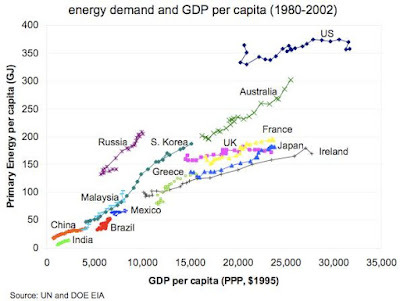 But, overall, the linear relation between GDP and energy consumption remains the same. We see "hockey sticks" (for Russia, for instance) they correspond to major economic crises, again not something that we would like to have. We clearly see here the hockey stick of the energy crisis o 1973-1982; it is much more evident for crude oil than it is for the aggregated world energy production. 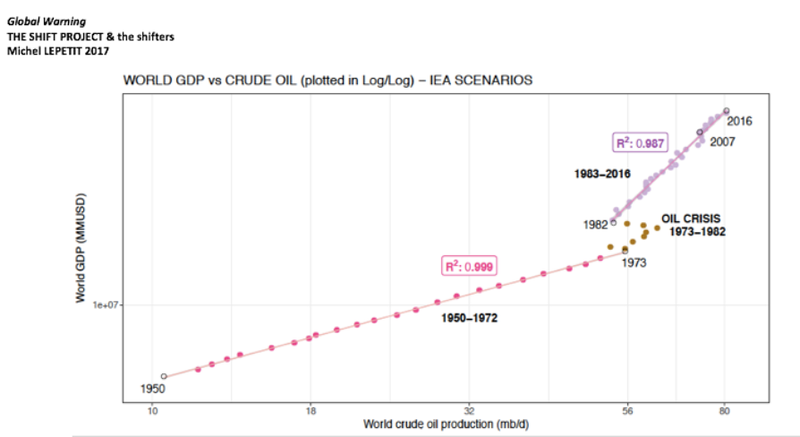 Note also how the slope of the curve of GDP vs. Production changed after the oil crisis. Evidently, the world's economy emerged from the crisis less reliant on crude oil: a certain degree of decoupling had occurred. As you see, true decoupling is quite a challenge. We saw that kind of slope change only for the great oil crisis of the late 1970s. Maybe we could see it again, today, only for another comparable crisis. Nevertheless, I don't think it is impossible to decouple from crude oil. As I argued in a previous post, the oil industry may be facing a "Seneca Cliff" as the result of the contemporary challenges of depletion and of technological change in transportation. But that would mean little to save humankind from a climate catastrophe if it is compensated by an increase in the production of energy from other dirty sources, say, coal. And so, we keep going and the future is waiting for us. "infinite consumption from a finite resource base is impossible"
I am a Cardiologist who convened the group "doctors and scientists for sustainability and social justice" in Brisbane from 2006 to 2013 www.d3sj.org. 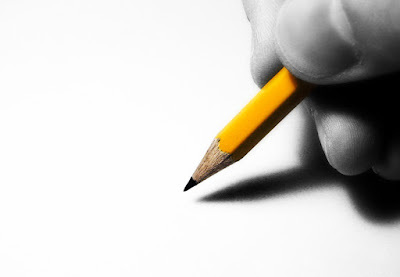 I am writing to your department in the virtually forlorn hope that a tiny handful of you may open your eyes to the most urgent public health issue we face, which will horrifically accelerate human suffering and die-off within a decade1. The effects are already being felt in many parts of the world, masquerading as global economic recession2 or the collapse of certain Middle Eastern societies. This issue has been ignored, denied and dismissed for years by "endless growth" economists and other flat earthers, but denial does not make a problem go away. 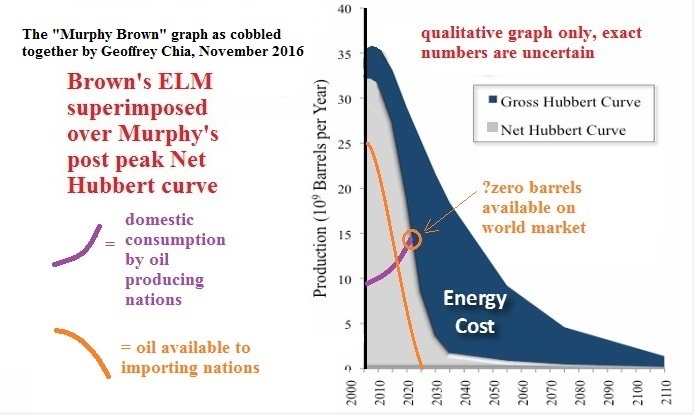 I refer to the looming catastrophic curtailment of liquid hydrocarbon fuels, the "net energy cliff" that we face in the near future, which will trigger ever more wars (perhaps even nuclear war), cause global economic and industrial collapse, and cause the die-off of billions of people worldwide. The countries most addicted to petroleum will be hardest hit and Australia will be no exception. Climate catastrophe is undoubtedly the greatest existential threat to humanity. Despite a huge campaign of deceit and denial perpetrated by the commercial media bankrolled by fossil fuel interests, it can no longer be ignored, now that we see ferocious firestorms burning communities to the ground or torrential floods sweeping through countries or unprecedented droughts, heat waves and storms year upon year. The horrific humanitarian consequences of sea level rise alone boggle the mind, let alone the devastation of our food bowls and other impacts3. However blinkered focus on climate disaster alone, without examining all aspects of the limits to growth, will result in everyone being blindsided by this more urgent public health issue. Especially because mitigation against climate disasters (fueling the fire fighting vehicles and aircraft, relocating and rehousing communities etc) will depend on energy we will not have. 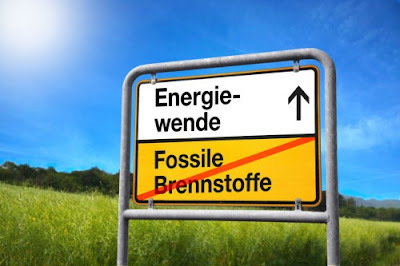 The looming collapse of industrial civilisation due to the net energy cliff will curtail fossil fuel emissions far more precipitously and effectively than any greenie campaigning or the Paris Accords can ever achieve. Why should you listen to anything I say? Because I cite robust information and analyses from honest independent researchers (not corrupted by business interests), views based on hard mathematics and the laws of Physics, every bit as indisputable as the law of Gravity4,5,6. I have repeatedly invited scientists and engineers to try to falsify these arguments, which they have been unable to do. "Sustainability" activists frequently state that "infinite growth on a finite planet is impossible" which is absolutely true. Equally true is the fact that "infinite consumption from a finite resource base is impossible". Our supply of "easy" oil is finite, is depleting in a non-linear fashion (net energy availability declines slowly at first, then abruptly falls off a cliff) and we cannot run industrial civilisation without it. 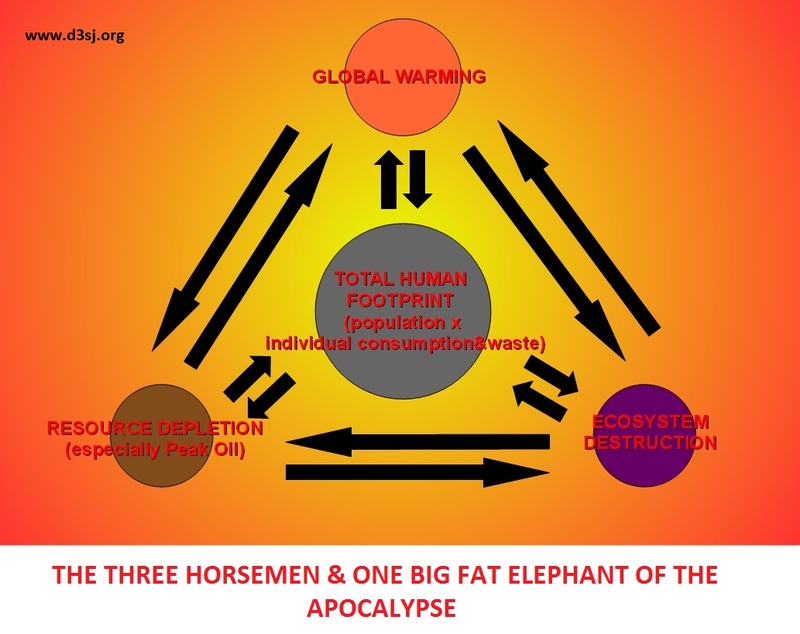 It is a fact that we have overshot the carrying capacity of this planet and there will be hell to pay when the "easy" oil suddenly dries up and we face cold turkey withdrawal. Contrary to the technofantasists, we have no upscalable alternatives6. Unconventional oil is a scam and those who promote it are liars or fools7,8 Current low oil prices have emboldened the peak oil deniers and led to widespread complacency. However low prices are largely due to demand destruction, not oil overproduction. Low prices do not change the reality of ongoing, relentless, terminal depletion of conventional oil. Prior to the global financial crisis of 2008, a tiny handful of individuals who looked at the hard data predicted that a looming sudden financial crash was inevitable. The only uncertainty was the exact timing. Meanwhile the majority herd of sheeple continued to place blind faith in a fraudulent system without looking at any data. The same situation exists today with crooked financial shenanigans based on bogus claims about unconventional oils made by deceitful commercial interests8. I expect most of you will ignore this message and bury your head in the sand. You will only have yourself to blame when food vanishes from the supermarket shelves, mountains of garbage pile up in your neighbourhood and centrally controlled services grind to a halt with dry taps at home, unflushable toilets and failure of the electric grid6. If the impending population cull results in the die-off of stupid people, biologists will simply attribute that to natural selection at work. If you open your eyes however, you will discover how feasible it is to protect yourself and your family from the worst effects of collapse, provided you plan in advance9. But time is short. The tiny handful of you who are sapient enough to apprehend this vital reality must spread this message to other potentially sapient people and you must incorporate Peak Oil studies where they firmly belong: as an integral and essential part of the Public Health education and research curriculum. I can only speculate why so-called "centres of learning" like UQ have essentially ignored this massive elephant in the room10. What about the risk of spooking the herd and causing a mass stampede by sending out this message? I have been a voice in the wilderness for more than a decade regarding this matter and despite meeting with and writing to politicians, doctors, scientists and engineers, have achieved no traction11. I know of only a few sapients who are truly aware of this issue, who can be counted on the fingers of an amputated hand. Richard Heinberg reckons that less than a million people worldwide actually understand how dire the near future is going to be. 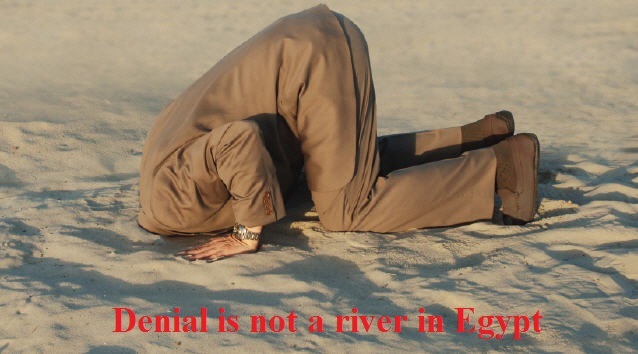 It is irrelevant if the vast majority of sheeple believe that the Earth is flat. If the data and evidence show that the Earth is round, then it is round and the majority sheeple are clueless and deluded. Truth is not determined by democratic vote nor majority opinion of the masses, it is determined by objective scientific scrutiny. The herd mindset has been completely captured by trivial drivel and monumental deceit perpetrated by the establishment media (who propagated the criminal "WMDs in Iraq" lies). Those corporate lackeys dismiss realists such as myself as "alarmists", to which I respond: if a house is on fire, those who raise the alarm are acting to save lives, but those who deny it are murderers. Listen or don't listen, live well or die miserably when the crunch comes, it is up to you. Former Queensland State Minister for Sustainability Andrew McNamara said to me years ago at a private meeting that he had no hope whatsoever that the political process will be able to address this issue. He should know, having tried his best during his time as Minister (he previously wrote a White Paper on Peak Oil vulnerability in Queensland with former Transport Minister Rachel Nolan, which was ignored). I was naively optimistic many years ago when Andrew and Rachel held office, that it may be possible for the majority of Australians to eventually transition to fossil fuel free sustainable lifestyles, guided by wise leadership and scientific recommendations. There is zero hope of that now and it is inevitable that the vast majority will die in chaos, perplexed and resentful that the promise of a flying car in every garage touted by the hubristic media was never delivered. 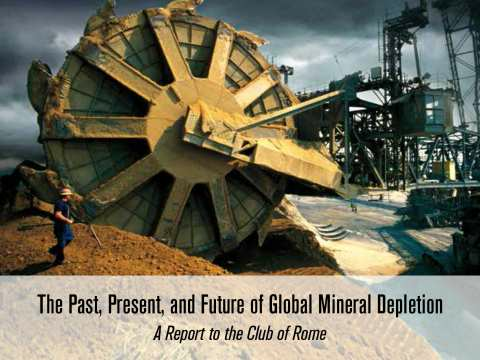 The 2019 Collapse Political & Attitude Survey by the "Doomstead Diner"
This is an excerpt from the review by Ugo Bardi published on the "Journal of Population and Sustainability"
Scientific studies that examine the food supply and its correlation to human population have a long tradition that goes back to Thomas Malthus and his “An Essay on the Future of Population“ of 1798. From then on, the field has remained politically charged. Still today, Malthus is often dismissed as a doomsday prophet whose apocalyptic predictions turned out to be wrong. But Malthus lacked the modern concept of “overshoot and collapse” and he never predicted the kind of population crashes that we associate to modern famines. Another study often accused of having been overly catastrophistic in terms of the future of the human population is the report to the Club of Rome titled “The Limits to Growth”, published in its first version in 1972. This is also a misinterpretation, since none of the several scenarios reported in 1972 foresaw a population decline before entering the second half of the 21st century. Overall, studies in this field may be considered pessimistic or optimistic: it is a fact that, so far, the world's food supply system has been able to cope with an increasing population that is reaching today about 7.5 billion people. The question is for how long that will be possible. 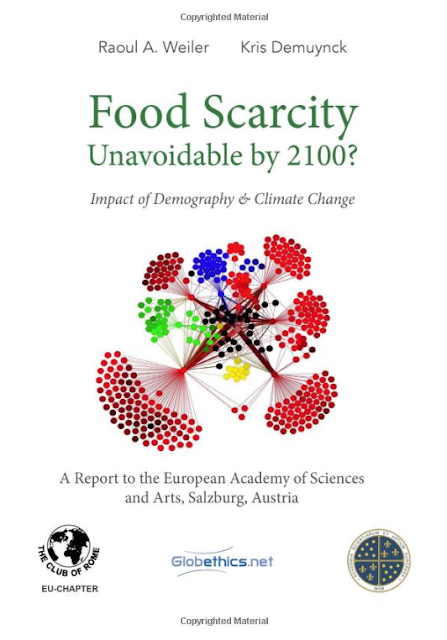 In analogy with the first report to the Club of Rome, the recent book by Weiler and Demuynck, "Food Scarcity" approaches an old problem with a new methodology. While “The Limits to Growth” was one of the first studies to apply system dynamics to the study of the economy, “Food Scarcity” is among the first studies that applies the modern network theory to the world’s food system. The resulting book is an ambitious attempt to pack an enormous amount of material into just 150 pages. It starts with a review of the situation of the world’s food supply with extensive data on the different climate systems, cultivation technologies, geographical conditions, and more. Is it a successful attempt? Under several respects, yes. An integrated approach is always better than the piecemeal approach of many superficial reports that don't go farther than admiring the increases in agricultural yield obtained so far and assuming that the trend can be continued forever and ever in the future. "Food Scarcity" does much better than this and identifies the limits to the world's food production system, which may lead to scarcity by 2100 or even earlier. At the same time "Food Scarcity" has limits in its approach dedicated mainly to food production. Surely, it is the central point of the story, but food supply is not the same thing as food production. In particular, there is no mention in the book of the importance of the financial system in the issue of feeding the world’s population. As I argue in my book, "The Seneca Effect", food is delivered to people today because people are able to buy it, otherwise it would rot where it is produced. A long lasting global financial crisis could crash the food supply system and create again major famines. And for such an event, we may not have to wait for the food production system to reach its limits in 2100. So, by all means an interesting book, well worth reading even though you have to take into account its aims and purposes. You can read the complete review by Ugo Bardi at "The Journal of Population and Sustainabilty"
This is a true story that took place a few years ago. There is no mention of "Christmas" in it, but I think it can be seen as appropriate to the Christmas atmosphere. A time in which we tell stories and we rethink about what we are and what we do. I have volunteered as a teacher to support disadvantaged children and I am here, helping boys and girls in junior high school who have fallen behind in their studies. Most of them are from poor families of immigrants. I have been teaching them science, history, literature, more or less everything in the curriculum. Today, I have in front of me a boy of around 12, Ahmed. Earlier on, he told me that his family came from Algeria and his father is a cook in a restaurant. Tall, dark-haired, with a light brown skin, he speaks perfect Italian. A nice boy, friendly and smiling. I am supposed to help Ahmed with biology. 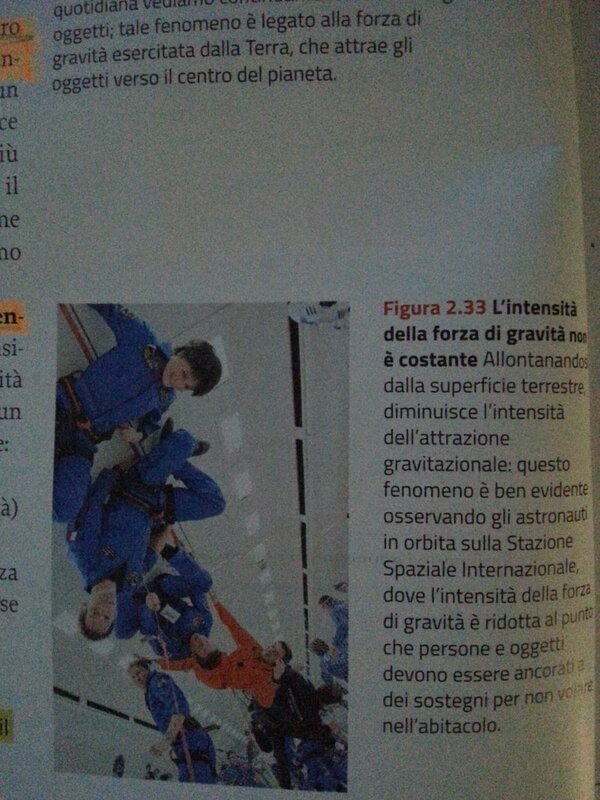 So, we open the textbook on the page he has to study. We read the text together, "eukaryotes have a nucleus and organelles, prokaryotes do not." I look at him, he looks at me. Clearly, this sentence makes no sense to him. 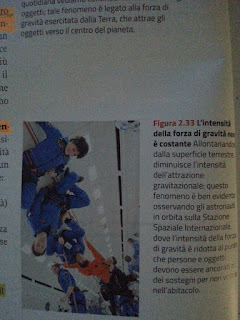 And I can understand why: the authors of the book, really, have no idea of what they are talking about. Prokaryotes and eukaryotes are described as curious little critters in the same vein as one could describe the animals of a zoo: "giraffes have long necks, zebras do not." It is not the first time in my life that I feel like the last centurion of the Empire, defending a world that is ceasing to exist. I am supposed to defend science, but what's happened to the science I know? It seems to have faded away with the legions of a disappearing empire. There is nothing in this biology book that describes the intricacy of the molecular mechanisms of life, nothing of the immense timespan of billions of years that led to life moving from bacteria and archaea to eukarya, and then to multicellular organisms. Nothing about the infinite complexity of ecosystems. Nothing about the amazing scientific journey that led us to understand how life evolved and changed. Nothing that could interest a 12-year old boy. This book is totally flat: plenty of illustrations but as exciting as a painting supplies catalog. I looked at several of these books. They are all the same: slick commercial books designed to convince teachers to push their pupils to buy them. But they are all like this: flat. Ahmed repeats the sentence as it is written, "eukaryotes have a nucleus and organelles, prokaryotes do not." He could as well be telling me that the capital of Madagascar is Antananarivo. I nod at him, he smiles at me. I have in mind to ask him, "do you understand what that means?" But I don't. I ask him, "do you like studying biology?" He says, "yes". Then he realizes that I understand that he spoke out of courtesy toward me. He adds, "but I prefer to study other things." "What do you like to study?" "The Holy Koran," he says. He seems to understand my perplexity, so he adds, "my sister and I are studying the Holy Koran. My sister is older than me. She can already recite some suras by heart." The feeling of being the last centurion defending the empire is becoming even stronger. I see myself as standing on one of the few surviving ramparts of the ruined walls of the capital city. Behind me, the city is almost deserted; the temples and the buildings half ruined, infested with weed and mice, the emperors forever gone. 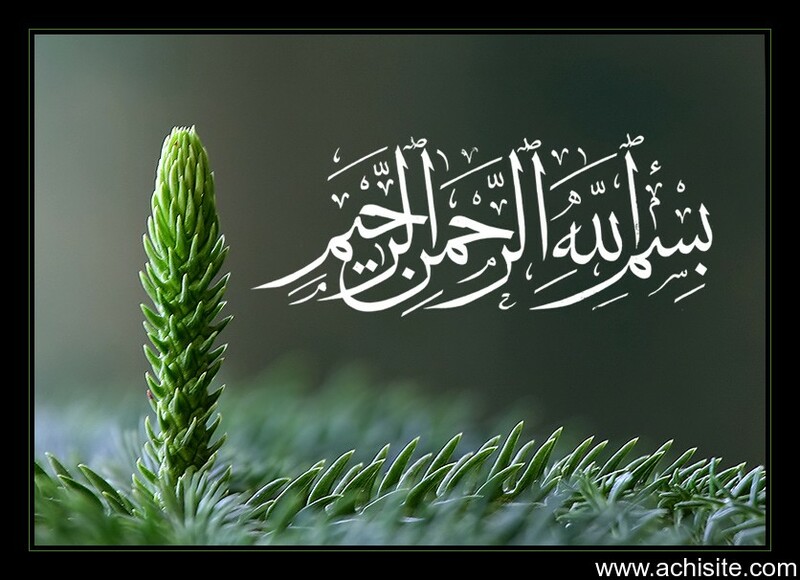 I say, "is it interesting to study the Koran?" He looks at me, perplexed. For him, the answer is so obvious that he can't even understand my question. But he does his best. He says, "My father says that reading the Koran makes you a better person." That's not an answer, it is an invitation. In no time, I have been turned from teacher to pupil. I try to answer the best I can, "I studied a little Arabic." "It is good that you did that." "It is not very easy." He smiles. "You can learn." He says. I nod, smiling at him. "I try to do my best," I say. We go back to the biology textbook. See that thing up there? It is an autonomous security robot, something that's becoming fashionable nowadays. Obviously, for every problem, there has to be a technological solution. So, what could go wrong with the idea that the problem of homeless people can be solved by means of security robots? After all, they are not weaponized.... I mean, not yet. There is something badly wrong with the way we approach what we call "problems" and our naive faith in technology becomes more and more pathetic. And now we are deploying security robots all over the world. Surely a "solution" but it is not so clear what the problem is. The story of this silly robot made me think of a post that I published a few months ago where I stated what I called "the golden rule of technological innovation: "innovation doesn't solve problems, it creates them". And the more I think about that, the more I think it is true. The post below was inspired by my participation at the ARABAL 2017 conference in Muscat, Oman to discuss the options for renewable energy integration in the aluminum industry. It addresses a seeming reluctance I encountered during the discussion to adopt RE with some initial considerations on how the industry can be transformed away from utilizing fossil inputs. It provides an overview of the industry’s products, scale and impacts, before discussing transition opportunities. Aluminum: an Investment for both present and future? Corrosion resistant when properly installed, malleable but strong and light, it is not surprising that aluminum is widely used. Globally, aluminum is the second most produced metal by mass after iron. Its historic production reached a peak in June 2017 at 175.5 thousand tonnes a day (approximately 60 million tonnes/year). Like all commodities, aluminum’s price fluctuates but has been growing since early 2016 from a low of $1500/tonne to above $2000/tonne in late 2017. While aluminum is often used in what could be described as “frivolous” consumer applications, it also has central roles in durable goods. Its advantages make it ideal for mobile applications like lighter, fuel-efficient vehicles but also for frames, cladding and cabling. One interesting aspect of the industry is that the metal offers unlimited recycling possibilities without degradation. In fact, more than 70% of the aluminum ever produced is estimated to remain in use today. From a transition perspective, this high recyclability can be considered as a long-term energy investment in the future availability of materials. Along the same lines, given aluminum’s resistance to oxidation, when used for applications like solar plant substructures it can remain in use for several panel generations allowing repowering of the installation. Primary (non-recycled) aluminum is produced from bauxite, an ore containing it at high concentrations. It is mined in open cut, surface mines that imply comparatively low energy intensity. As an ore, it contains impurities (primarily silicates) that need to be removed in order for high purity aluminum oxide (Al2O3), alumina in industry parlance, to be made available for further use. 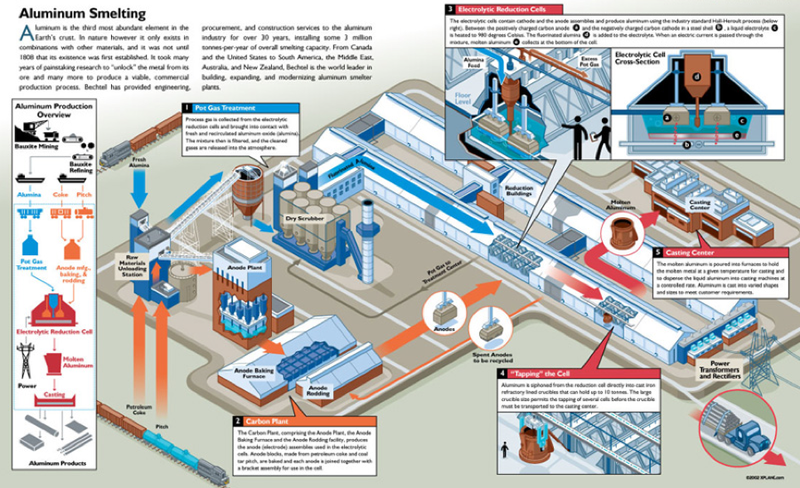 The Bayer process for refining requires both electric and thermal energy inputs. First, it involves crushing, washing, and drying the ore. The resulting powder is then dissolved in caustic soda (NaOH) at temperatures ranging from 160-280 C depending on the ore type. Once dissolved, impurities are separated leaving a residue red mud. The alumina slurry is dried in calciners at temperatures >1000C to remove chemically bound water giving the final product the texture and appearance of hard sugar. The global average energy input to the process was 11.4 MJ/kg Al in 2016 of which only about 7.5% was electrical. Smelting (see Fig 1) takes place literally in a pot – the industry’s term for electrolytic cell. Cells are electrically connected in series (the cathode of one to the anode of the next) forming a pot-line that can be anywhere from 100 to 400 cells. The cell container has an external steel structure and acts as the cathode. Alumina is dissolved into an electrolyte formed by a molten mixture of cryolite (Na3AlF6) and aluminum fluoride (AlF3). Being highly corrosive, it is able to dissolve alumina powder at less than 1000C which otherwise would require much higher temperatures to melt (>2000C). Alumina is poured continuously into the cell to maintain a concentration level of around 2-4%. Normal operating voltage for each cell is 4-4.5V inducing 300-800kA currents to electrolyze alumina into Al and O2. To reduce adverse magnetic field impacts and help with insulation, cells are aligned the pots on their longer side (see Fig. 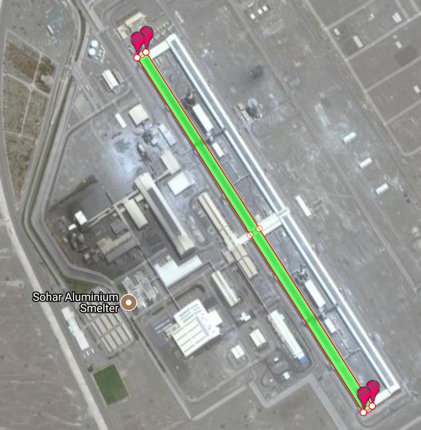 2) leading to facilities more than a kilometer long and around 50-meter wide. Perhaps the biggest complication of the process is the reactivity of the molten cryolite - it can quickly corrode most known materials. It is contained by keeping it in balance with solid cryolite. Power and thermal management are critical. In the event of a power outage of more than a few hours (max four), the cells cool down and eventually solidify requiring a very expensive cleaning and restarting process that can last months. Excess power may melt the solid cryolite lining leading to uncontrolled leakage of the molten contents - a tap-out. Finally, as alumina is reduced to Al concentrating on the cathode, the oxygen atoms quickly consume the carbon anodes to form CO2. 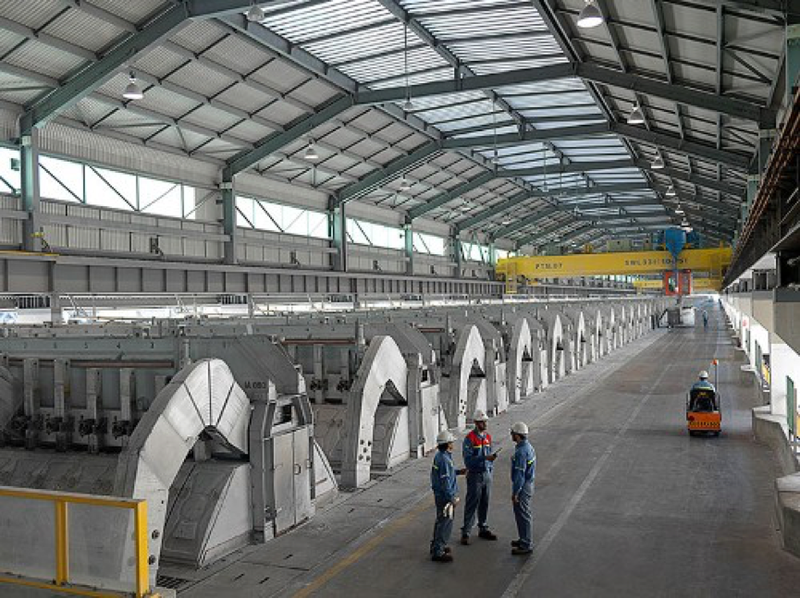 An entire wing of the smelter is dedicated to continuously manufacture these carbon electrodes using low sulfur petroleum coke (pet-coke) as a raw input. Like every transition process, renewable energy transition of the aluminum industry requires attention to its defining aspects: physical resources of energy and materials but also mental and social resources. Smelter managers are understandably risk-averse. Two smelters in the MENA region recently suffered power outages, one due to a tap-out that melted the main bus bar, leading to significantly hobbled output for months. Stable, reliable, and cheap power is entrenched in their world-view and requires serious convincing and solid demonstrations of how alternative approaches would operate reliably. Nevertheless, no matter how high are the infrastructure capital expenditures - reaching above 1 billion USD for a modern refinery, the costs of its operation are equally high as we will see below and therefore there are clear economic reasons to consider both efficiency and lower energy costs. To produce 1 kg of primary aluminum requires 1.93 kg of Alumina from 4kg of bauxite, 0.4-0.5 kg of Carbon, 20 g AlF3, 50 g cryolite, and 12-16 kWh of electricity. In terms of carbon dioxide emissions and assuming that perfluorocarbon emissions are avoided or treated, this implies 1.65 kg of CO2 from the anodes. If an efficient combined cycle gas turbine (CCGT) plant is used to generate electricity using natural gas as fuel, the specific emissions of electricity would be around 400g/kWh or 5.2 kg of CO2. The contributions of mining and global shipping of the material in a bulk carrier are comparatively much smaller (see Fig. 3) and will not be discussed here. The provenance of primary (non-recycled) aluminum significantly influences its carbon footprint. This is clearly shown in Fig. 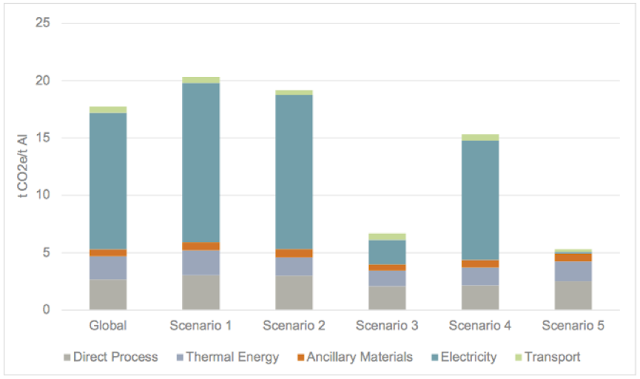 4 where aluminum produced using coal-power in China (S1) may be four times more carbon intensive than aluminum produced using hydro-power in the Americas (from 20 tCO2eq/tonne Al to 5) under the most benign (idealized) scenario. 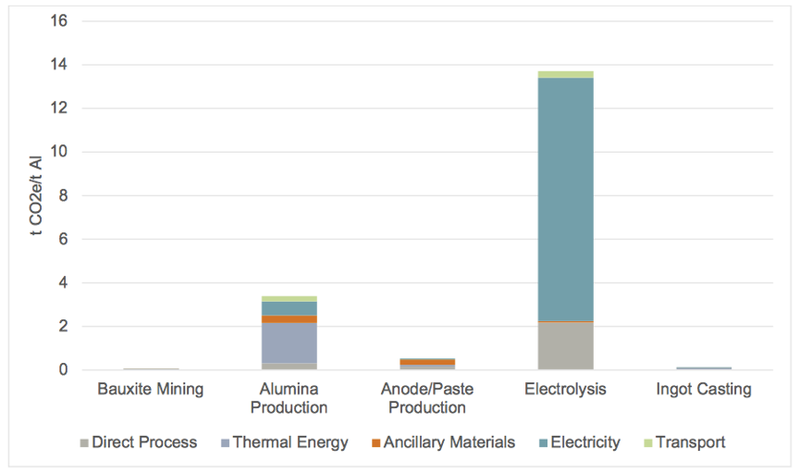 Alternative technologies like direct reduction of alumina by melting in a solar furnace or ionic liquid electrolytes that would allow the electrolysis to take place at low temperatures are considered but far from commercialization. Considering the time-frame of the transition and sunk investments, the current aluminum production process will be the prevalent production system for the critical transition period of the next few decades. Looking at the key components of the current Bayer and Hall-Héroult processes for aluminum production, the focal points for decarbonization in order of magnitude would be (i) electricity input, (ii) thermal input for refining, (iii) substitution of the carbon anodes with inert ones. In order to achieve (i) and (ii) both efficiency and flexibility improvements would be helpful as the bulk scalable renewable energy will be coming from variable sources (solar and wind). Practically, all smelters in the MENA sunbelt are auto-producers - i.e. they have their own captive power plants. 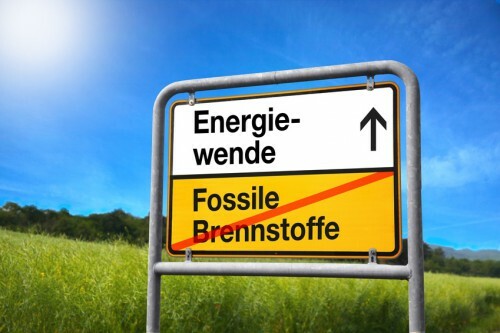 Therefore, they are well suited to follow an incremental path to renewable energy adoption. We discuss how using the Sohar Aluminum plant as a case. The plant produced 377,000t in 2016 with an intensity of 13.7 kWh/kgAl - 590 MW average power consumption. It has a dedicated 1GW CCGT within 12km operating at 50% efficiency. The building surface area of the Sohar plant is approximately 8 hectares (Fig. 5L). 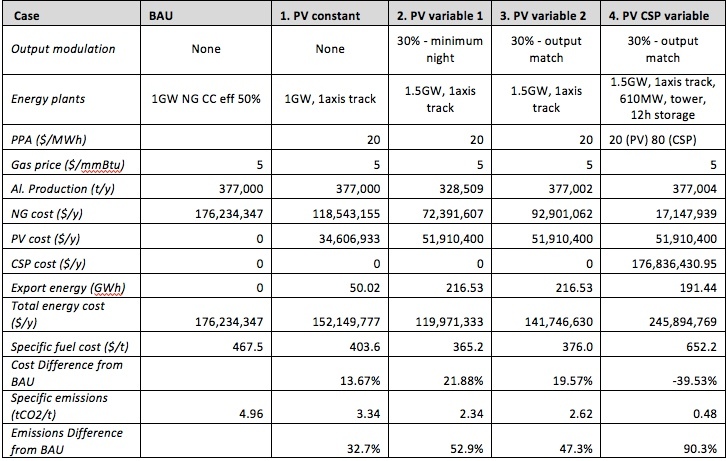 Installing roof-top PV (density 1.2 MW/ha) only provides 10MW – clearly insufficient. Ground-mounted, utility-scale plants are needed. The shaded strip to the North of Sohar (Fig. 5R) between the mountains and the coastline is 26000 hectares, flat and empty. It could host more than 13GW of installed PV, greater than the total installed capacity in the country (around 9GW). The economics of renewable energy for a smelter with a captive CCGT (combined-cycle gas turbine) are straightforward. The PV plant acts as a gas saver reducing the overall costs of energy. Assuming that the smelter acts as the off-taker guaranteeing a power-purchase agreement, for such a large-scale plant, it should be able to achieve at least $20/MWh given recent world-record bids. The plants could be bi-facial, single axis tracking allowing an increased capacity factor. The financial benefits of off-setting natural gas use depends on its price. Alas, Oman does not have a clear market price for it. Oman exports LNG while it also imports gas from Qatar through the Dolphin pipeline and plans to build another pipeline to import gas from Iran. Oman uses NG for domestic needs including electricity, industry, and enhanced oil recovery and there are references to a shortage that anticipate stopping exports and diverting all gas to domestic uses by 2024. 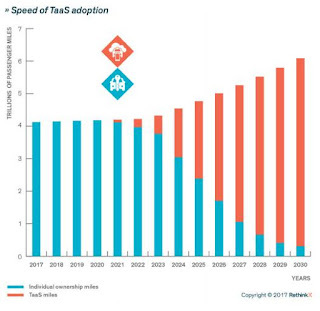 I infer that industries to date receive gas at subsidized prices but, from a country perspective, there is an opportunity cost in offering these subsidies. Unsubsidized gas prices would range between $4 to $8 per MMBtu. If a decision was made to completely transition the smelter operations to renewable energy, storage would be needed. The options for overnight operations would include pumped storage using sea water, large-scale batteries, but the most viable option currently would be to rely on CSP (concentrated solar power) plants with thermal storage. Based on another world record, a PPA (purchase power agreement) of 80$/MWh for energy delivered overnight seems achievable. In any case, given that the solar peaks in daytime, the ability to modulate the refinery energy consumption and match the supply flux would be highly desirable. While conventional smelter-management thinking considers any type of power modulation as detrimental, a system that is possible to be retrofitted to existing smelters allows for exactly this. Known as Enpot and implemented already commercially at a Trimet smelter in Germany permits the modulation of refinery output and consequently power use by +-30%. The technology relies on surrounding the cells with a series of heat exchangers. This allows power (and alumina feed-rate) modulation as cell-heat removal rates can be varied by opening or closing the heat-exchangers. The 2016 production of 377 thousand tons required 35 million mmBtu at an annual cost of $176 million assuming a gas cost of $5/mmBtu, or a specific energy cost of $467.5/ton of Al. We considered four RE options against current practice, shown in Table 1 and Fig 5. In Cases 1-3 the CCGT plant remains in operation. Case 1 operates the plant at constant output. 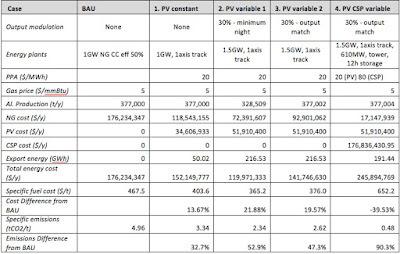 Installing a single-axis PV system of 1GW capacity with a PPA of 20 $/MWh would reduce the energy costs by about 13.6%. 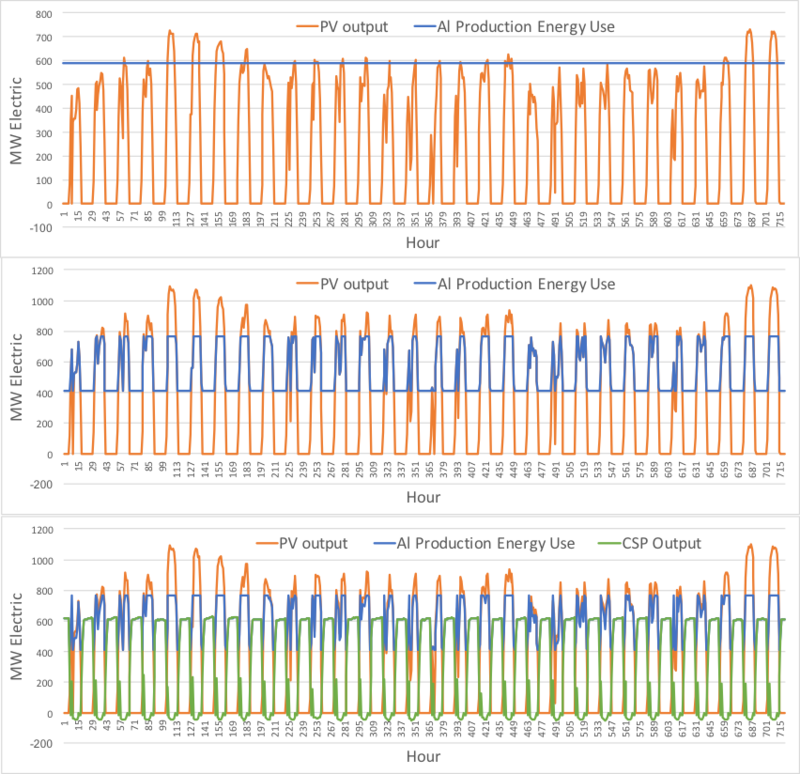 Increasing the PV capacity to 1.5GW to utilize the variable production system decreases energy costs by 22% (Case 2) or 20% (Case 3) if output is equal to BAU while emissions are halved. Case 4 combines 1.5GW PV with 610MW CSP and 12-hour thermal storage for near zero emissions. This option expectedly results in a 40% higher cost system. 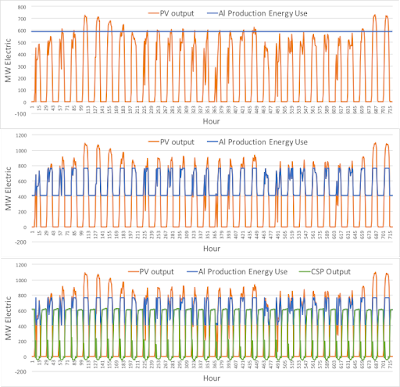 Summarizing, integrating large-scale solar PV generation in smelter operations in the sunbelt countries can provide unconditional economic benefits. This does not involve additional capital costs to the smelter assuming that an offtake PPA agreement is established with a build-own-operate (BOO) model for the solar plant. Incorporating output variability acts synergistically as it allows the smelter to leverage the peak insolation during daytime. Even more drastic emissions cuts to essentially carbon-zero can be achieved by incorporating a CSP plant with thermal storage for night operations. This would imply an increase in the electricity costs by about 40% at current prices and an additional 3800 ha of land. As other storage options become more competitive this calculus will change and it would reach cost parity once the cost of stored RE electricity drops below $50/MWh. Dr. Sgouris Sgouridis is an Associate Professor at Masdar Institute (UAE). His current research interests focuses on sociotechnical systems modeling including sustainable transportation systems and sustainable energy systems management. Dr. Sgouridis is Principal Investigator researching ‘Commercial Aviation in a Carbon-Constrained Future’ at Masdar Institute and he is co-leading the development of the Sustainable Bioresource Projects. The Limits to Growth was published in 1972 by a group of world class scientists using the best mathematical computer modelling available at the time. It projected the future collapse of global industrial civilisation in the 21st century if humanity did not curb its population, consumption and pollution. It was pilloried by many “infinite growth on a finite planet” economists over the decades. However, updated data inputs and modern computer modelling in recent years (particularly by Dr Graham Turner of the CSIRO in 2008 and 2014) showed that we are in reality closely tracking the standard model of the LtG, with industrial collapse and mass die-off due sooner rather than later. The future is now. The LtG looked only at 5 parameters, with global warming being a mere subset of pollution. Dramatic acceleration of ice melt and unprecedented, increasingly frequent, extreme weather events over the past two decades clearly demonstrate that global warming is progressing far faster and far worse than anyone could possibly have imagined back in the 70s. Global warming certainly deserves a separate category for consideration on its own, quite apart from the other manifestations of pollution. The LtG did not include a specific category looking at the human dynamics of finance, economics and political manoeuvrings, which was fair enough, because it is impossible to mathematically model such capricious irrationality. Economists may beg to differ, however no economic mathematical model has ever been shown to accurately reflect the real world, nor ever consistently predict anything useful (unlike the LtG and other proven science based models), not least because of their hopelessly incomplete and deeply flawed ideological economic assumptions. Garbage in, garbage out. In 2013, the “Nobel-type” prize for economics (properly termed the Bank of Sweden prize) was jointly awarded to different economists who had mathematically modelled diametrically opposing ideas. That was akin to awarding the physics prize to different scientists who “showed” that the universe is both expanding and contracting at the same time. Despite that, I do advocate that we should include finance, economics and politics in our subjective conceptual framework of collapse mechanics, because financial and economic troubles are triggers for political upheavals which can lead to conflict and the collapse of nation states. Syria is a prime example. This unquantifiable category, despite being subjective and unpredictable, will nevertheless significantly contribute to population die-off, just as any quantifiable category such as global warming or resource depletion or ecosystem destruction can and will cause human die-off. Economic collapse can lead to loss of healthcare, homelessness and starvation. Political madness can trigger global thermonuclear war at any time, causing our extinction. All the categories contributing to collapse are deeply inter-related and intertwined. This is the basis of systems thinking, which is essential for making realistic judgements about our future and mitigating against the troubles ahead. How can we confer such complex ideas to the general public in a manner which is clear and understandable, yet does not significantly compromise accuracy or detail? It is a refinement of my older, less complete, 2D model "the three horsemen and one big fat elephant of the apocalypse", originally conceived as a joke, a play on a hackneyed biblical phrase, albeit with serious intent. When various pundits try to analyse matters relating to sustainability, their biggest deficiency is often blinkered or tunnel vision. They focus on only one issue while ignoring other issues. Most global warming "solutions" advocated by climate activists fit this description. They assume limitless energy availability to deliver huge renewable energy infrastructures and massive carbon sequestration fantasies to enable an approximation of business as usual to support 10 billion people by mid century. 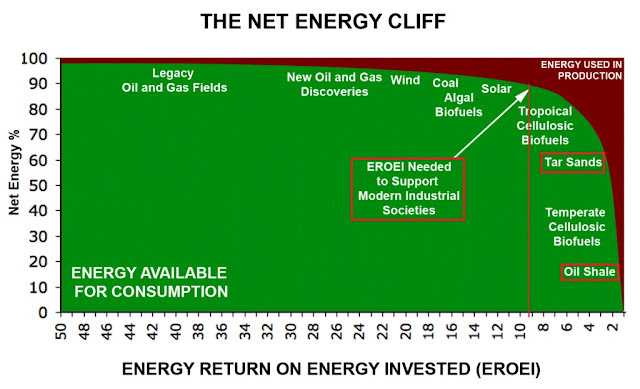 In reality we are poised to fall off the cliff of net energy availability very soon 1,2 and not even the most optimistic carbon sequestration fantasies (all of which will require colossal energy inputs and none of which are proven) will be able return us to a stable climate unless the total human footprint is also reduced drastically and immediately 3 (which will not happen short of global nuclear war – which in itself will exponentially release greenhouse gases, devastate remaining ecosystems and destroy industrial civilisation and thus our ability to technologically sequester GHGs). Blinkered views produce flawed pseudo-solutions, which if attempted often exacerbate other problems, or at the very least are a complete waste of time and energy. 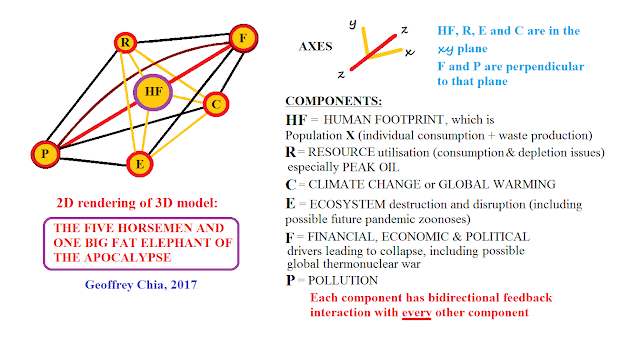 Here is a 10 second video-clip, my first attempt to make this 3D model in real life, "doom explained by confectionery abuse"
In my 3D model I have maintained the central position of the total human footprint as the "big fat elephant", to emphasise that if this is not addressed, then nothing is being addressed. Few commentators advocate voluntary energy descent, reduction of consumption or simplification of lifestyles, however those are essential strategies to reduce our footprint. Even fewer talk about population reduction. This 3D model is a far superior way to visualise the predicaments we face, compared with disparate and disconnected one dimensional views or compared with simple mnemonic headings. For example, the three "Es" of energy, economy and environment represent a simplistic and incomplete text list, with no graphical demonstration of the links between each "E". Trying to further subdivide, refine or complicate this model is likely to be counter-productive. As it is, this 3D model, a six sided double pyramid with a proliferating tumour at its core, probably represents the limit of complexity which can easily be stored in the average mind as a visual snapshot. It is an easily remembered image which can be conjured up at the dinner table by scribbling on a napkin or by building the actual 3D model with meatballs and skewers, to both entertain and horrify your guests. Compartmentalising the various intertwined global issues is obviously an artificial approach, but is necessary to help us understand the highly complex dynamics involved. It is necessary in the same way that compartmentalising the study of Medicine into specialties such as Cardiology, Gastroenterology, Neurology, Nephrology etc is an artificial but proven approach to understanding the highly complex mechanisms within the human body. Just as different bodily systems (heart, gut, brain, kidneys etc) directly interact with and influence each and every other system, each component of my 3D model also directly interacts with and influences each and every other component. R affecting F: every major oil disruption eg 1973, 1979, has always resulted in economic recession. Another R affecting F example: diminishing per capita resources leads to economic hardships, shattered expectations and anger in the population, which leads to the rise of megalomaniacal fascist demagogues, multiplying the risk of global conflict. R affecting F affecting R, affecting E and P: decline of conventional oil production since it peaked in 2005 has led to desperate harvesting of unconventional oils pushed through by means of political deceit, fraudulent market misrepresentations and financial/economic distortions. This Ponzi scheme will lead to an inevitable market crash dwarfing the sub-prime mortgage scam. It has also led to severe exacerbations of E and P.
Unfortunately with today's advanced state of planetary malaise, most of the feedbacks between components are "positive" or bad self-reinforcing feedbacks. Few are "negative" or good semi-correcting feedbacks. The reader will no doubt be able to think of many other examples of bidirectional feedbacks between components, both positive and negative. 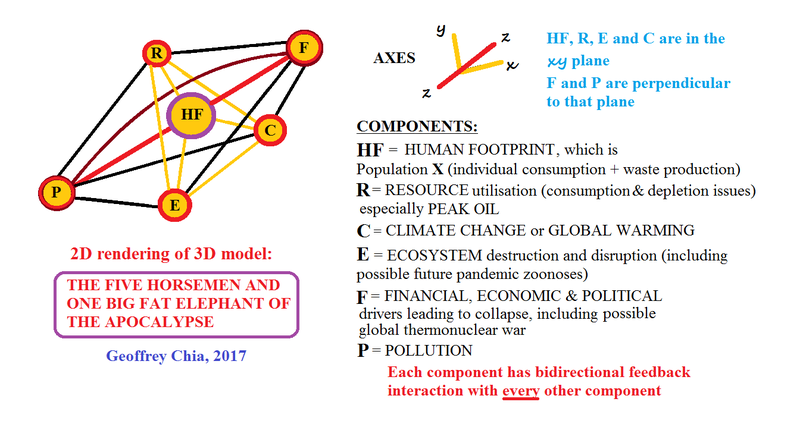 I advocate that each article discussing sustainability (or lack thereof) should be slotted into the part or parts of this 3D model where it belongs, in order to appreciate how comprehensive or incomplete that article may be, and to enable other related discourses to be slotted into adjacent positions, so as to build up a more holistic picture. As visual animals I believe this is a useful tool to educate ourselves. It can even be used in primary schools as part of their science curriculum (but will no doubt be banned amongst global warming denialist groups or neoclassical/neoliberal economic madrases). Children can make these simple 3D models with toy construction kits or plasticine and sticks. They should probably be discouraged from playing with their food, unlike us adults, who are terrible hypocrites anyway. Geoffrey Chia is a Cardiologist in Brisbane, Australia, who has studied and written about issues regarding (un)sustainability for more than 15 years.